By Dan Henderson: The 5th of November saw Scotland’s Ricky Burns beat the hard hitting Australian Michael Katsidis via a unanimous decision to become the World Boxing Organization (WBO) Interim Lightweight champion in what was a good performance. Ricky used his jab well and covered up during Katsidis’s attack which was pretty relentless for twelve rounds. A lot of fans and experts were expecting Burns to lose. The question a lot of people have asked me is. Who does Ricky fight next? There are a few options out there for Ricky he could face either IBF Champion Miguel Vazquez or WBC Champion Antonio Demarco and go for a second world title. My choice would be for him to face Kevin Mitchell in a fight which would be a great domestic fight. It is a fight that is easily able to put together as both fighters are promoted by Frank Warren. The venue is a tricky choice in my opinion it would most likely be held in London at the o2 Arena or Wembley Arena. This has the potential to be a great fight would do nice to top a bill with a strong undercard. Who do I think would win? Personally I think it depends on Mitchell’s mental state if his head is in it then for me he wins the fight. I like Ricky Burns a lot I’m proud for the contribution he has made to British boxing and it was a shame he didn’t win the British boxer of year award. For me the Mitchell fight should be made it is the best option in my opinion. Maybe the winner of this fight could end up facing the winner of the Murray Vs Rios fight. 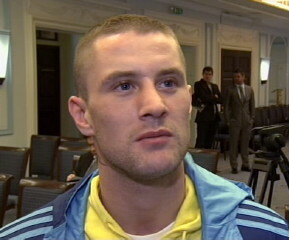 Boxing » Ricky Burns » Ricky Burns: Where next?